Neste made its final investment decision worth USD$1.6 billion to more than double its renewable diesel production in Singapore by adding an additional 1.3 million tons of annual production capacity. The plant exports significant volumes to the U.S. The total project will produce 150 MMly and will reduce GHG emissions by more than 550,000 metric tons per year, which is equal to roughly 10 percent of British Columbia's 2030 target reduction for transportation as detailed in the CleanBC Report. Following U.S. EPA's decision to grow the biomass-based diesel standard under the Renewable Fuel Standard, Evonik has announced that the company is expanding its sodium methylate production capacity in Mobile, Alabama, to 90,000 metric tons per year. 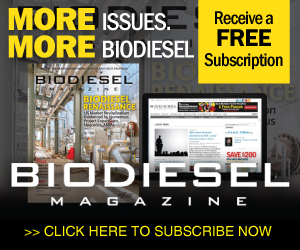 While many biodiesel industry stakeholders told Biodiesel Magazine they were encouraged by higher volumes in the final 2019-'20 RFS rule, the associations that represent them criticized EPA for its decision to not address small refinery exemptions. UFOP calls for urgent action by application of customs duties on imports of palm oil biodiesel. The EBB warns that import duties to be applied in 2019 will be circumvented by the increased import of palm oil for production of biodiesel in the EU. The key issue affecting the product chain of rapeseed processing and biodiesel production in Germany is the uncertain transport situation due to low water levels in Germany's rivers that have curtailed the flow of goods and led to rising prices. A new study released Nov. 29 by FTI Consulting analyzed the financial and socioeconomic impact of the U.S. biodiesel industry and found that the $1 per gallon biodiesel tax credit is essential to the industry's growth and prosperity. REG announced Dec. 6 that its board of directors has named Cynthia (CJ) Warner to the position of president and CEO effective Jan. 14, 2019, at which time she will also join the board of directors. Randy Howard will remain on the board of directors. The National Biodiesel Board Fair Trade Coalition submitted comments for the record Dec. 3 on how the U.S. Department of Commerce should conduct recently initiated changed circumstances reviews of U.S. duties on Argentine biodiesel imports. The NBB and more than 50 member-companies and affiliated organizations delivered a letter to House and Senate leaders, urging them to enact a multiyear extension of the biodiesel and renewable diesel tax incentive before Congress adjourns.